Actor Peter Fonda, Headed West to 'Yuma' Actor Peter Fonda is probably best known for his role in the cult-classic road movie Easy Rider. His new picture, 3:10 to Yuma, is a Western — a remake of the 1957 film. Fonda, son of actor Henry Fonda, is author of the memoir Don't Tell Dad. 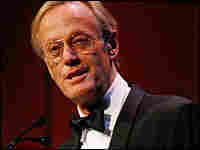 Actor Peter Fonda is probably best known for his role in the cult-classic road movie Easy Rider. His recent roles include one in the film 3:10 to Yuma, a 2007 remake of the 1957 Western of the same name, which was itself based on the 1953 Elmore Leonard short story. The movie also stars Russell Crowe and Christian Bale. Fonda, the son of actor Henry Fonda, is also the author of the memoir Don't Tell Dad. This interview first aired on Aug. 16, 2007. 3:10 to Yuma is now available on DVD.